NSUI recently organised a press briefing where they proposed a set of changes that should be made in the DUSU elections. The elections are scheduled to take place on 12 September this year. 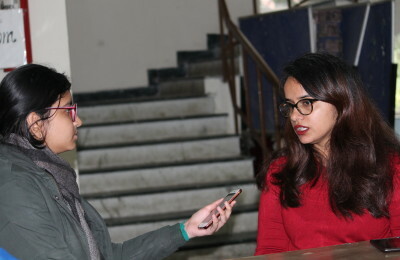 With the Delhi University Students Union (DUSU) elections nearing day after day, parties are gearing up to win as many seats in the office bearing positions. The National Students Union of India (NSUI), organized a press briefing on 24 August where they proposed a set of electoral reforms which they wanted to see in the upcoming elections that are scheduled on 12 September this year. ID CARDS: The eligible students should be provided with ID cards at least one week prior to the day of polls. And if the students are not provided with ID cards, government recognised ID cards should be accepted along with the admission/fee slip. POLLING AGENTS: Just like the Election Commission of India (ECI) has put in place a system of polling agents for transparent elections, such polling agents should be placed for every candidate contesting the elections. MOCK EVM DRILLS: Similar to the elections conducted by the State and Central Election Commission, a mock drill of these Electronic Voting Machines (EVM) should be conducted in front of polling agents to check whether the machines are functioning or not. USE OF VVPAT MACHINES: Voter Verified Paper Audit Trail (VVPAT) machines should be used in the DUSU elections and at least 5% of the machine polling should be cross checked with the paper trail. REGULATED COUNTING OF VOTES: Increased transparency should be done through EVM-wise counting in front of the candidates/polling agents. EVMs can be mixed to ensure the anonymity of results. DECENTRALIZED CONTROL ROOMS: Decentralized Control Rooms should be allotted that shall be manned by the representatives of Election Commission for prompt redressal of grievances from the date of notification of election till the voting day. INCREASED VOTING TIME: The duration for voting should be increased for the convenience of students living far off. The morning shift should take place from 8 am- 1 pm while the evening shift should take place from 2pm-7pm. This shall result in greater turnout and provide greater legitimacy to the winners. ALTERATION IN SECURITY: The Excessive presence of police on campus during elections should be avoided as it intimidates the voters, especially first-year students. Also, excessive barricades affect voters turn out since students need to cover longer distances on foot. PROVISION FOR RECOUNTING: A provision for recounting/repolling in the colleges should be made where substantive allegations of unfair polling are made. It will be interesting to see if these changes are adopted or not. Also, NSUI proposes that the changes notified should be intimated to all colleges, prominently displayed in colleges and a copy of it should be given to all the candidates.